Whether you’re looking to lose weight, curb your sugar intake, eat organic, non-GMO foods, or you’re simply health-conscious, food labels and Nutrition Facts are information resources that can help you make healthy, informed decisions about your diet. In July 2018, the U.S. Food and Drug Administration (FDA), the governing body that provides nutritional analysis for the public, will require food manufacturers to use an updated Nutrition Facts label, the first time since 1990. While the new labels will look similar, they will include important changes that we’ll explain here. The Nutrition Facts label is the black and white, rectangular-shaped label found on packaged food products. Because it specifies serving sizes, the number of calories, ingredients, and the food’s nutritional breakdown, it’s a tool you can use to make informed decisions about the food you eat. Although fresh fruits and vegetables, unless packaged in bulk, generally don’t have a Nutrition Facts label, they are typically labeled with price look-up (PLU) codes, which are the small stickers affixed to apples, bananas, and the like. It requires some know-how, but PLU code stickers can tell you whether produce is organic or conventionally grown. The USDA also has a food nutrition database and food nutrition chart that is helpful when evaluating foods. Since food labels provide vital information about ingredients, serving sizes, calories, nutritional information, and food allergens, reading them should be the first step when you’re deciding which foods to purchase. The amount and type of food you eat have a tremendous impact on your overall wellness, so whether you’re trying to maintain good health or improve your health, food labels provide the information necessary to help you compare products and make smart dietary choices. They’re also designed to be clear and easy-to-read, which means that with a little know-how and context, you can be an expert at understanding and analyzing the labels. How Do I Read the Nutrition Facts Labels? The Nutrition Facts label is made up of 5 sections. Starting from the top, below the phrase “Nutrition Facts,” you’ll find the serving size for the food and its measurement, which is often in grams, ounces, or cups. You’ll also see the number of servings in the container. Understanding serving sizes will help you decide how much you should eat. As I write this, I just happen to have a half-eaten bag of Cacao Goji Power Snacks on my desk, so I’m going to use that as an example. Based on the level below, one serving of the goji snacks equals about three pieces. If you eat half of the bag in one sitting, about 12 pieces, you quadruple the number of calories and other nutrients shown on the label. The next section lists calories per serving on the left side, and calories from fat on the right side. According to the FDA, foods with 40 calories or less are low-calorie foods, foods with 100 calories are moderate, and high-calorie foods are those with 400 calories or more. Following the calories, you’ll find a breakdown of the macronutrients: fat, carbohydrates, and protein, as well as a few other important substances – namely salt (sodium) and cholesterol. First listed is total fat, which is broken out further as saturated fat and trans fat. Next comes cholesterol, which is not a form of fat, but rather a compound produced in the liver, and found in meat and milk products. Next comes sodium, followed by total carbohydrates, which are categorized as dietary fiber and sugars, then the next macronutrient, protein. Listed on the right side of the column is the % Daily Value for each, which is explained below. Underneath the macronutrient section, the label has a thick line, followed by a listing of % Daily Value of certain vitamins and minerals which vary by food. Only vitamin A, vitamin C, iron, and potassium are required to be listed on every label, but this will change in the new nutrition label. Some foods may contain more vitamins and minerals than what is required to be listed on the label. In the footnote, the FDA requires this statement “%DVs are based on a 2,000 calorie diet” – although the phrasing will be changing in the new food label. Additionally, some labels may have an optional section that lists the recommended amount of fat, cholesterol, sodium, and carbohydrates based on both a 2,000- and a 2,500-calorie diet. The FDA does not require this if the label is too small. Ingredients are usually listed below the Nutrition Facts label, in order of decreasing quantity. In other words, the first item listed is the most abundant, followed by the second most abundant, and so on. For example, if a label for packaged guacamole lists the first ingredient as avocado, the product is made up mostly of avocado. Of course, the same goes for products that contain high fructose corn syrup in the first few ingredients. What Does Daily Value (DV) and % Daily Value Mean? Daily Value is the Recommended Daily amount of a substance that the FDA recommends an average person on a 2,000-calorie diet should consume. It follows that % Daily Value (%DV) means the percentage of the Recommended Daily Value this particular food contains. The Nutrition Facts label includes a “% Daily Value (%DV)” column on the right side of the label, and you can find the % of each nutrient in that food, based on a 2,000-calorie diet. From this information, you can determine if a particular food has too much sodium or cholesterol for your needs, or has a healthy amount of dietary fiber, for example. Some people may consume fewer or more calories each day than the 2,000 or even the 2,500 listed in the footnote, but use the % Daily Value as a guide to help them figure out how much of a particular nutrient the food has versus how much they want. 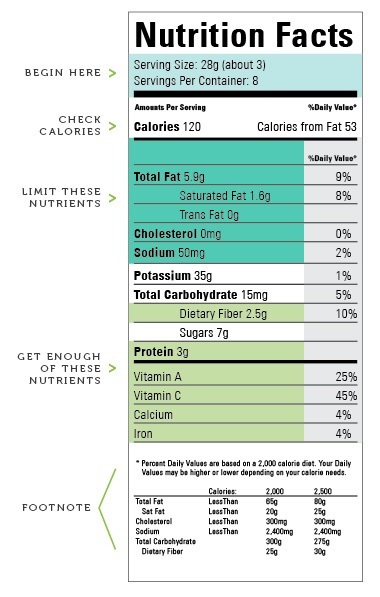 When reading Nutrition Facts labels, 5% DV or less is considered low for a nutrient while 20% DV or more is high. It’s a good idea to read these numbers carefully because fiber and iron, for example, are essential nutrients, while things like cholesterol or sugar are best limited. You’ll notice that protein, sugar, and trans fat do not have a %DV. Although a diet high in trans fat and sugar has been linked to weight gain, high cholesterol, and heart disease, the FDA doesn’t include a %DV because they had not established official guidelines for how much people should consume for a healthy diet – although this is changing in the new food labels. When it comes to protein, a food manufacturer is only required to list %DV if the product makes a health claim such as “high in protein,” or something similar, or the food is meant for children under four. The last time the Nutrition Facts label was fully updated was in 1993. Since then, health experts have learned a lot more about the specific nutrients we need, ingredients we should avoid, and how much a typical person consumes. The FDA requires manufacturers with $10 million or more in annual food sales to use the new food label by July 26, 2018, and smaller food manufacturers by July 26, 2019. However, a proposed rule extends the deadlines to January 1, 2020, for large manufacturers and January 1, 2021, for small ones. These labeling requirements will affect imported foods, as well. How Will the New Food Label Be Different? 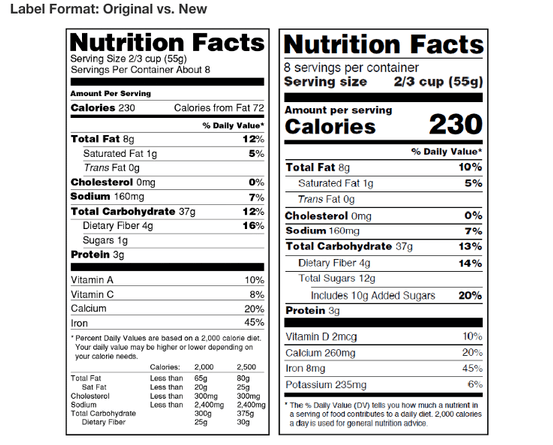 The FDA requires that all food and drink manufacturers use the new Nutrition Facts label. The new label is based on new science, research about nutrition and public health, updated recommendations from health experts, and consumer feedback. The Nutrition Facts labels keep the same overall look, but font size will increase for calories, servings per container, and serving size. The number of calories and serving size will both now be in a bold font. Food manufacturers must now include both the actual amount in grams plus the %Daily Value for vitamin D, calcium, iron, and potassium, but it will now be optional for them to include the amount or %DV for vitamins A, C, and other vitamins and minerals. These changes came about because Americans fall short when it comes to getting enough vitamin D, calcium, iron, and potassium in their diets. Vitamin D is important for bone health, and potassium plays a role in keeping blood pressure lowered. On the other hand, most people now get enough vitamin A and C.
Food labels will soon be required to include an additional line for added sugar, which is sugar that was not a natural part of the food but was added. The added sugar will be listed in both grams and as % Daily Value. All major health organizations, including the World Health Organization (WHO), Institute of Medicine (IOM), American Heart Association (AHA) and The American Academy of Pediatrics (AAP), agree that added sugar should be reduced in our diets.The FDA states: “…it is difficult to meet nutrient needs while staying within calorie requirements if you consume more than 10 percent of your total daily calories from added sugars.” Personally, I fully believe that, with a little knowledge and planning, you can obtain the calories and nutrients you need without added sugar. Information about total fat and saturated and trans fats will continue to be a part of the Nutrition Facts label but “calories from fat” will no longer be included. The FDA and other authorities have determined that it is not the total amount of fat eaten but the type of fat that has the most effect on overall nutrition and health. The serving sizes that most Americans eat have doubled or even tripled since the last serving size requirements were published in 1993. Old serving sizes often did not reflect how much people actually would eat in one sitting – such as a small bag of potato chips or a full can of soda. The new serving sizes will be updated to reflect the amount people tend to eat. In the past, snack food packages or soda bottles would state that they contained several servings, but most people eat the entire package or drink a can or bottle at one sitting, which means they’re getting double or triple the calories, sodium, and fat listed in the serving size. Now, the FDA will require small snack packages to be labeled as one serving. If the food contains more than a single serving but might be consumed in one sitting – like a large bag of potato chips – food manufacturers will include a “dual column” to include the calories and nutrients that are in one serving as well as the entire package or unit. So, if you do eat that entire bag of chips, you’ll know how many calories you’re consuming, without having to do your own calculations. There are a couple of other changes that will affect food labels, although separate from the Nutrition Facts label. As of June 18, 2018, the FDA will not allow partially hydrogenated oils, also known as trans fats, in human food with the exception of specifically approved items that require permission from the FDA. The FDA has given food manufacturers three years to get to full compliance, but some companies started phasing out trans fats as early as 2006 when the FDA first required trans fat to be listed on Nutrition Facts labels. Scientists have linked trans fats to heart disease and the accumulation of plaque in arteries, and, thus, have determined that they are no longer “generally regarded as safe” in any food. Trans fats still occur naturally in meat and dairy products, and in some oils as a result of the manufacturing process. In July 2016, President Obama signed The National Bioengineered Food Disclosure Law that requires labeling of foods containing genetically modified organisms (GMOs) for the first time. GMO-containing foods should be labeled by July 2018, but with the federal governmental transition, they are behind schedule though attempting to stay on track for 2018. The new law requires most food products to have a label, symbol, or QR code that can be scanned by your smartphone to tell you if the food contains GMOs. The package may even contain an 800 number that you can call to find out. How Do You Know If Your Food Has GMOs? Between 70 and 80 percent of foods in the United States contain GMOs. Just reading the ingredients or the Nutrition Facts label won’t necessarily tell you if your food has GMOs. Until the new GMO labels fully take effect, here are suggestions to ensure the foods you buy do not contain GMOs. Organic foods that carry the USDA’s 100 percent organic seal shouldn’t contain GMOs, but it’s important to know that the USDA also doesn’t test products for GMOs. The best way to ensure the foods you purchase are non-GMO is to look for the Non-GMO Project Verified Seal. This organization verifies foods contain no more than 0.9 percent GMOs. Consumer Reports tested foods that carried non-GMO certifications and found that the foods didn’t contain GMOs. However, a few products that claimed to be GMO-free without certification did contain more than 1% GMOs. Additionally, products labeled natural – which 60 percent of people think means non-GMO – contained GMOs. Unless the package carries the Non-GMO Project Verified seal, it’s safe to assume that all food products made with corn and soy also contain GMOs and should be avoided. Ingredients derived from canola, corn, soy, and sugar typically contain GMOs. This includes baking powder, cellulose, corn starch, lactic acid, lecithin, riboflavin, miso, soybean oil, soy protein, soy sauce, vitamin E (tocopherol), and xanthan gum. When it comes to sugar, avoid food that lists “sugar” on the label, as it usually comes from sugar beets, which are genetically modified. Although cane sugar, molasses, agave, and turbinado sugar are non-GMO, I believe that natural, raw honey is the best sweetener. Do food labels and ingredient lists influence your food-purchasing decisions? Do you think the new labeling requirements will help people make good decisions? Leave a comment below and share your thoughts with us. There is no distinct code for genetically modified foods, and many types of conventionally grown produce are genetically modified. Genetically modified organisms (GMOs) are plants, animals, and microorganisms whose DNA has been altered through genetic engineering. According to a 2013 report by the Grocery Manufacturers Association, 70 to 80 percent of foods contain GMOs. Although research on the health effects of GMOs is controversial, there is a reason to believe they may have negative health consequences. Needless to say, it would be helpful to have a PLU code that identifies GMO-based produce. Unfortunately, this does not exist. Although the prefix “8” was previously reserved for genetically modified food, its use never caught on with food producers. The best way to avoid genetically modified food is to shop for organic food.